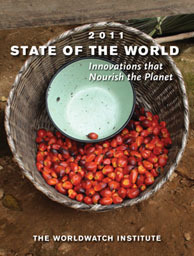 The 2011 State of the World edition from Worldwatch was released yesterday. It is reported to give a compelling look at the global food crisis, with particular emphasis on global innovations that can help solve a worldwide problem. The pdf version costs $19.95! Why isn’t that document a free public good?